University of Chicago Press, 2016. 232 pp. Shortly before assuming the presidency in 1913, Woodrow Wilson told a friend that “it would be an irony of fate if my administration had to deal chiefly with foreign affairs.”1 This now famous exchange notwithstanding, the advent of World War I and the expansive, idealistic vision that Wilson articulated for the postwar order ensured that he and his administration engaged in foreign affairs deeply during his time in office. Furthermore, Wilson’s Fourteen Points and the outcomes he sought at the 1919 Paris Peace conference shaped international relations in the twentieth century profoundly. It is not surprising then that historians, political scientists, and other scholars have written extensively about Wilson’s presidency and foreign policy. In some ways, Wilson anticipated the global order that emerged in the latter half of the twentieth century, yet his views and policy objectives—not to mention his white supremacist and patriarchal ideology—remained embedded in the mores of his particular time, upbringing, and religious culture. Wilson was, in part, a product of the Protestant social gospel movements of the early twentieth century. 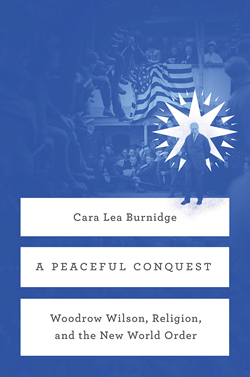 It is into this intellectual milieu that Cara Lea Burnidge plunges in her excellent monograph, A Peaceful Conquest: Woodrow Wilson, Religion, and the New World Order, which situates Wilson and his foreign policy within the context of social gospel Christian exceptionalism, internationalism, and imperialism. Throughout the book, Burnidge argues that Wilson’s conception of democracy, as well as his belief that the United States had a mission to propagate democratic governance throughout the world, should be understood through the history of religion and American religious culture. Social Christianity, with its attendant social gospel theology, promoted a particular standard for an ideal society where “great individuals cared for the least among them” in line with the model of Jesus, yet also reflected the social and racial hierarchies of the time. (3). As Burnidge notes, “for Wilson, democracy was a form of government based in a Calvinist notion of God’s order that regulated citizens according to social divisions he understood to be natural and inherently good, particularly whites’ racial superiority and patriarchy.” (3). Burnidge reveals how Wilson applied this social Christian model and understanding of democracy to international relations, extrapolating from the individual ethos of service that he believed “great individuals” owed to the less fortunate and applying it to the national and international realm. Wilson blended his belief that democracy offered the most ideal and Godly form of government with his embrace of hierarchical social divisions, articulating a moral imperative that called “great nations,” specifically the United States, to help the world by spreading democracy. To advance this rich and nuanced argument, Burnidge first traces Wilson’s intellectual and spiritual development, beginning with his childhood in a white evangelical family living in the antebellum and then Civil War South. She notes that “the Wilsons, together with their church and surrounding community, taught their children in word and deed that white male leadership was at the heart of God’s design,” and this core belief informed Wilson’s understanding of society and his place within it. (14). Yet as American Christianity changed during the decades following the Civil War, Wilson’s beliefs modulated as well. Burnidge suggests that Wilson occupied a transitional space between modernism and orthodoxy in this period, embracing both traditional elements of Protestant eschatology and the nascent progressive social gospel, with its paternalist focus on serving the public good. Burnidge then discusses the religious dynamics of progressive politics in the early twentieth century, highlighting white Protestant anxiety about the increasing numbers of Catholics, Jews, African Americans, and immigrants and the perceived effects they had on electoral politics and American life. Christian intellectuals such as Josiah Strong viewed these changes with alarm and urged white Protestants to address social ills, reassert American culture, and “redefine the proper boundaries of social life through state-based reform.” (33). Burnidge situates Wilson’s political maturation within this context, exploring how Progressive ideology animated the 1912 presidential election, when Wilson ran on the Democratic ticket against William Howard Taft, Theodore Roosevelt, and Eugene V. Debs. She notes that once Wilson assumed office, it became clear that he “understood his policy agenda as a means through which to apply Christian principles to the modern age,” as he “associated his political office…with a postmillennial obligation to regenerate society through service to those less fortunate.” (49). In this way, Burnidge very effectively weaves together Wilson’s background and Presbyterian upbringing with the prevailing cultural, political, and religious currents of the Progressive era, revealing Wilson’s intellectual evolution as well as the persistence of his core beliefs about social and racial hierarchies. Throughout the rest of the book, Burnidge explains how these Protestant exceptionalist beliefs informed U.S. foreign relations during the Wilson administration. When world war broke out in the summer of 1914, Wilson asserted American neutrality and envisioned the possibilities for postwar peace. Indeed, according to Burnidge, Wilson “considered this war an opportunity for the United States to demonstrate its willingness to serve the world through Christian internationalism,” a role that would enable the country to reshape the world in its image by spreading democracy and liberal capitalism. (55). By 1917, when the United States entered the war as a combatant, Wilson and other Christians described their support for the fighting in terms of service, now casting the war “as an opportunity to advance a Christianized democracy in which the powerful cared for the powerless across the world.” (77). Winning the war would put the United States in a position to negotiate the peace and ensure that the resulting peace agreement protected national sovereignty and democratic principles—the strong United States caring for the world’s smaller or lesser nations. Burnidge reveals how Wilson’s social gospel principles, as well as his white supremacy, paternalism, and American exceptionalism, infused the Fourteen Points and the agenda he brought to the Paris Peace Conference. 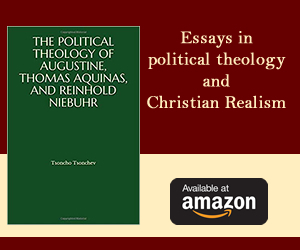 Most intriguingly, she argues that fierce resistance to the peace treaty in Congress grew out of disagreements about “Christian ethics, cosmology, and millennial expectation,” which “simmer[ed] beneath the surface of white Protestants’ shared rhetoric of unselfish Christian service.” (108). According to Burnidge, these religious disagreements manifested themselves in divergent views about the role the United States should play in the world—should it serve as an example of Christianity and democracy or should it actively promote Christianity and democracy?—and that this divergence contributed to the rejection of the treaty. Although other scholars have certainly addressed religion when writing about Woodrow Wilson and Wilsonian internationalism, the argument that Burnidge makes in this book is novel. By examining the development of Wilson’s foreign policy thought through the lens of social Christianity, race, and social order, she sheds new light on Wilson as a president and on American Protestantism in the first decades of the twentieth century. The book is expertly researched, drawing on a wide range of sources that recreate the intellectual nodes of white Protestant society in the Progressive era. It is also written in a clear, compelling style. To be sure, this is an intellectual and religious history as much as it is a history of Wilsonianism, and it focuses on the ideas that shaped policies more so than on policymaking, the war, or the peace negotiations themselves. Yet nevertheless, by bringing religion into the story in this way, Burnidge helps us better understand the American role in World War I and the tumult that followed it. 1 Quoted in Ray Stannard Baker, Woodrow Wilson: Life and Letters volume 4 (NY: C. Scribner’s Sons, 1931): 55. The friend was Edward Grant Conklin, a biology professor and colleague at Princeton. Lauren F. Turek is an assistant professor of history at Trinity University. A diplomatic historian by training, she has research interests in the history of U.S. foreign relations, religion, and the international human rights movement. Her current book project, To Bring the Good News to All Nations: Evangelicals, Human Rights, and U.S. Foreign Relations, illuminates the complex and deeply significant ways in which religion and religious groups interacted with foreign policy, political culture, and the international human rights regime to shape America’s role in the modern world.